New York - More Americans are shunning costly home broadband and using their cellphones to get online, a new survey shows. Eighty percent of U.S. adults had Internet access this year, whether through a smartphone or a home Internet connection, up from 78 percent two years ago, according to the survey published Monday by the Pew Research Center. 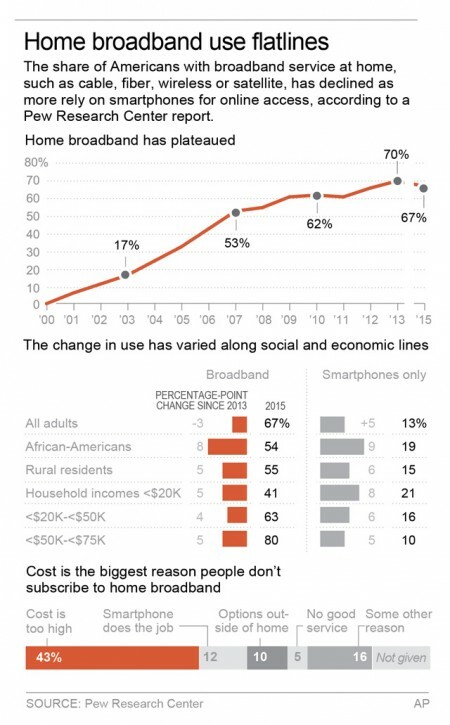 But after years of home broadband growth, slightly fewer adults in 2015 got Internet from providers like home phone or cable company, mostly because it’s too expensive for them. The number dropped to 67 percent from 70 percent in the center’s 2013 survey. Meanwhile, the number of people relying on cellphones alone for Internet rose to 13 percent this year from 8 percent in 2013. That plateau in home broadband use comes as the Obama administration has pushed for greater broadband access and criticized the lack of competition among home Internet providers. The dip in home Internet use could just be temporary, said Pew researcher John Horrigan. Adoption also flatlined five years ago before picking up again, which he said likely had to with economic difficulties in the aftermath of the recession. For those without home Internet, 33 percent say the biggest reason is the monthly cost is too high, while 10 percent say a computer is too expensive. But 12 percent say they don’t need it, a smartphone is sufficient. Of those only getting access through a smartphone, the increase is biggest among low-income Americans. But a smartphone isn’t as easy to use as a home computer when it comes to applying for jobs and is often limited by data caps. Only 5 percent of people who don’t have home broadband access say that it’s primarily because it’s not available or the speed is too slow, underscoring the growth of broadband networks throughout the U.S. over the past 15 years. Nearly half of people who don’t have broadband at home have never had it and aren’t interested. That’s partly tied to age: 39 percent are 65 or older. The Pew report drew on a September 2013 survey of 6,020 U.S. adults and several polls conducted in spring, summer and fall of 2015 that included, in total, 6,687 adults. The margin of error for the home adoption finding was plus or minus 1.3 percentage points in 2015 and 1.4 percentage points in 2013.